Library facilities of this college were extended from book issue to supply of all needs of readers such as journals, internet facilities, news paper, separate reading room to boys, girls & staff, computers for daily use to students & staff, PG thesis, retrieval of CD Rom databases, online e-journals (CeRa), journals, Online ETAD (e-theses abstracts database), e- books, ISO food products database is made available through LAN for in internet cell. video cassettes, photo copying facility etc. 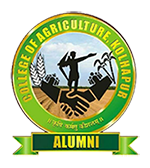 ,At present the library has huge collection of books in the field of agriculture and allied subjects (total collection of more than 40 thousand books). The library is receiving periodicals, magazines, news papers, books for competitive examination. This collection is increasing as per the demand of the readers. This library is well equipped with all the necessary furniture’s to supply and to ease handle of the available facilities. All the library collection is shelved in their respective section such as book section, computer section, periodical section, back volume section, reference section, newspaper section etc. There is a separate reading & internet facility to girls, boy’s student and staff members. CCTV camera system was installation in library to avoid the misuse of library facilities by the students. Identity card is compulsory for getting access to the library and it must be produced whenever demanded by the library authority. Registration should be done to become a library member prior to using library resources. No personal belonging allowed inside the library. Enter your name and sign in the register kept at the entrance counter of library and also at internet cell before entering. Two books for UG student seven days and four books for PG student will be issued for ten days period thereafter, Rs. 1 per day will be charged. Use internet facility for study purpose only. Books will be issued on presentation of the ID card. Students are instructed to check the books while borrowing and they will be responsible for any type of damage or mutilation noticed at the time of return. If the books are lost, then borrower shall replace the books of the same edition or latest edition or pay the existing cost of the book after getting permission from the library. Students are require to handle the books/ journals very carefully. Marking with pencil, writing or highlighting, tearing the pages or mutilating the same in any other way will be viewed very seriously. In such cases reader shall be held responsible unless these are brought to the notice of the library staff at the time of issue. The computer facilities consisting of Local Area Network (LAN) with 40 nodes are available at the central library for the use of UG-PG student and faculty members, 10 mbps VPN (BSNL) internet lines are sanctioned for College of Agriculture Kolhapur Library. Established digital knowledge centre with 40 computers and all necessary infrastructures includes CCTV security system, server, printers, UPS, scanners, along with internet connectivity. Email and internet service are made available to the students and faculty.